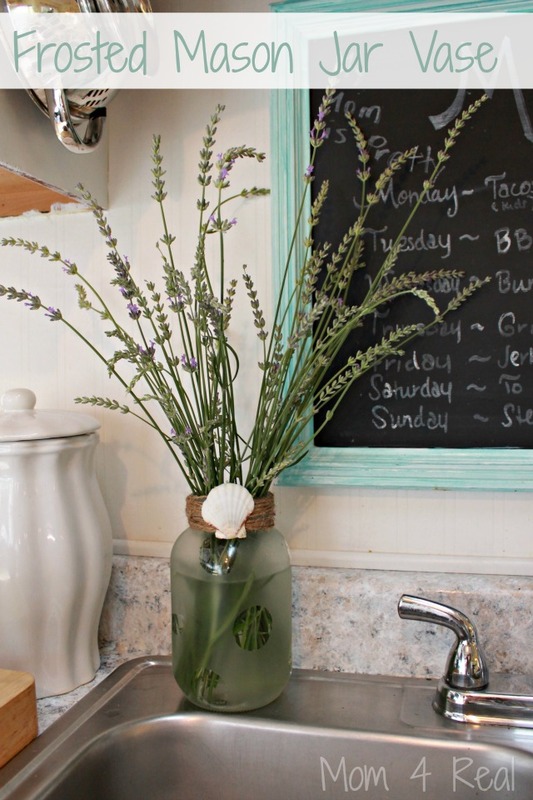 Today I want to show you how I brought two of my favorite things together…mason jars and lavender. I was snipping some of my lavender the other day, and plopped it down in a mason jar vase filled with water. It was super cute, but I thought hmmm…it could be cuter! 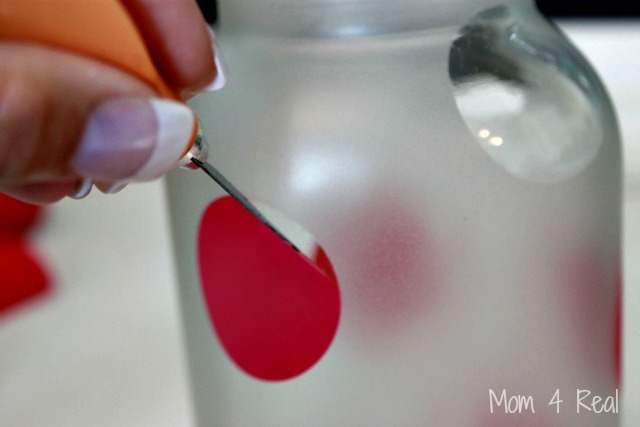 I decide to try out some frosted glass spray paint that I bought for a Christmas ornament project last year. I made this cute frosted mason jar vase using a few things I already had, and I absolutely love it. I started with a large glass mason jar. I had a case of generic jars that I bought on a recent trip to Walmart, so I decided to use one of them. 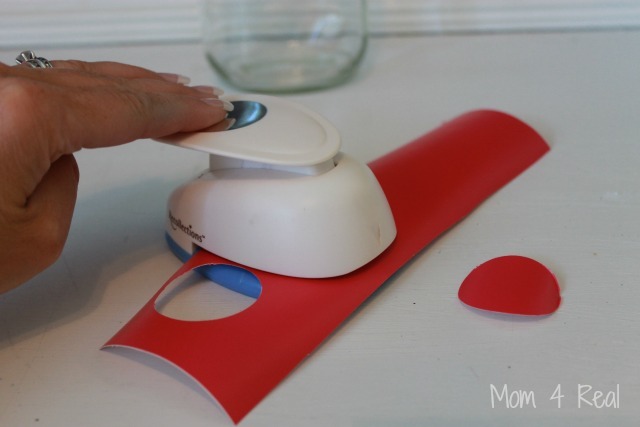 I used a circle punch to cute some vinyl scraps I had. 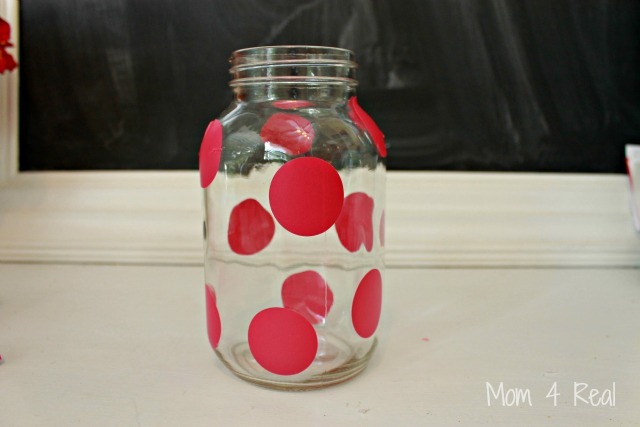 Then I applied the vinyl circles all over the jar in a random pattern. 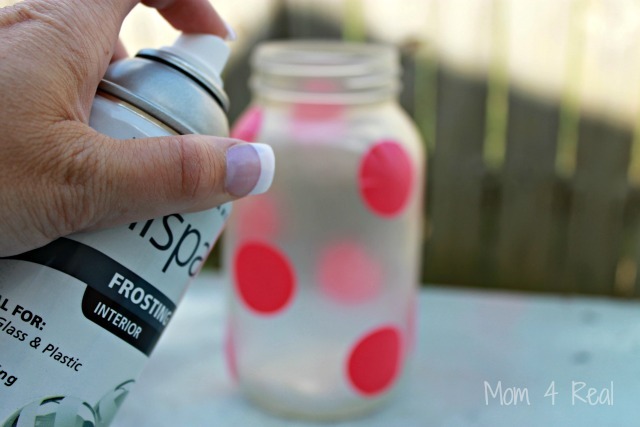 Next, I took my jar outside and gave it 3 coats of frosted glass spray paint. This stuff dries so quickly, it literally took less than 10 minutes for all three coats. Then I removed the stickers. 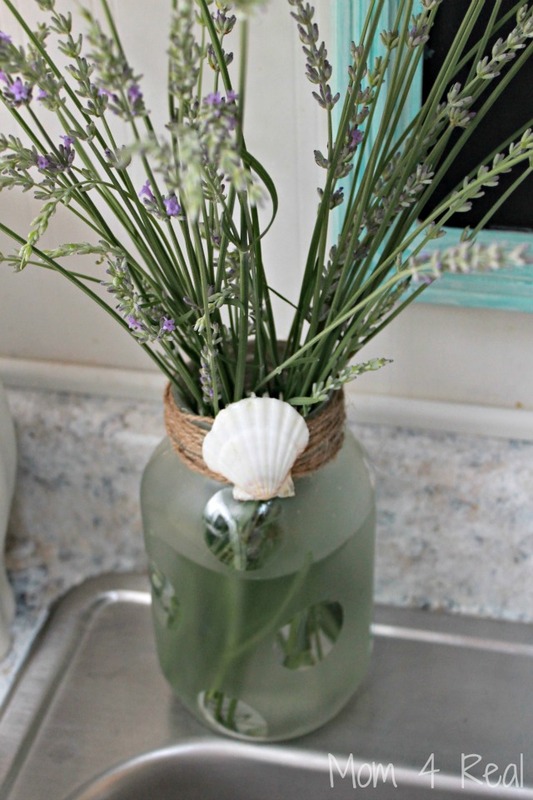 I decided to give it a beachy look, so I wrapped some twine around the top and hot glued a seashell to the front. I plopped my bouquet of lavender down inside with some water, and I just LOVE it!!! It oozes country charm and fits perfectly with my cottage decor! Sharing at Homestories A to Z and Savvy Southern Style. « 10 DIY Room Projects and Monday Funday! Oozes it does! I love this Jess! I just love it, Jessica. Totally adorable.! I am totally doing this! Love it Jessica! Found your blog thru the Cutting Edge stencil site. I have subscribed and think I’ll be on here for quite awhile being so inspired I’ll have a hard time turning this machine off tonight. Love your blog and every project I’ve seen so far. We have a mfg. home with really crappy cheapy cupboards. There’s vinyl paper on walls with a pattern that has nothing to do with a kitchen, aaarrrggghhh. I’ve washed the walls down and now some of that paper has come off. 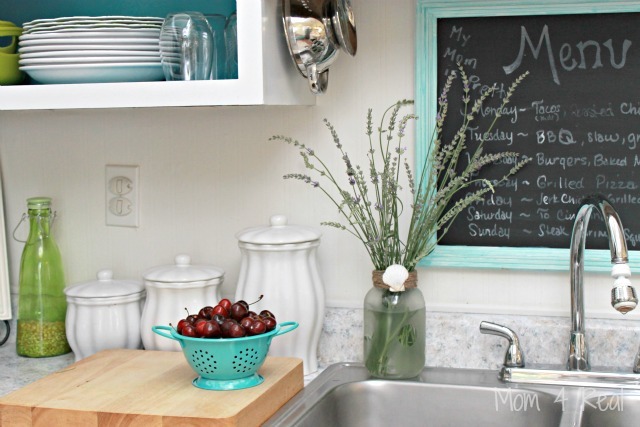 I’ve been totally inspired to paint the back splash and stenciling as shown on Cutting Edge. Fantastic ideas. I also have a portable small kitchen island so want to paint it and perhaps stencil on it. Used to do all kinds of stenciling years ago when it was so popular so will dredge up that experience and get to it as soon as I can afford to buy a stencil for back splash and island. I use stenciling on some of my signs since I don’t have a cameo or portrait machine, possibility of owning one is pretty darned remote, so goes life. Sorry for getting off subject of your wonderful frosted mason jar, really love it. 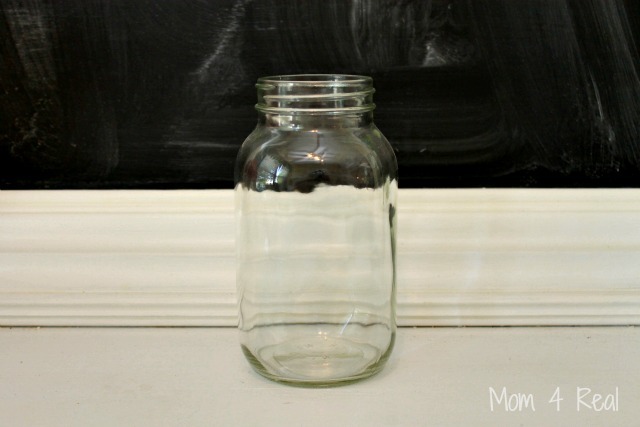 Will have to give it a go with one of my thrift store jars. It’s perfect for so many things.